Although Voodoo has long since had a reputation for being a rather sinister form of religion, it is an intriguing culture and there is a lot more to it than simply poking pins in Voodoo Dolls. Some of the most prominent and interesting patrons of Voodoo have been the focus of artists for centuries, including Baron Samedi, the master or Loa of the dead. Baron Samedi will watchfully guard over cemeteries, helping the dead to transfer into the underworld after death. Get Baron Samedi on your side by playing online play slots and he may use his ancient black magic to line your pockets, but be wary, he is an outrageous character with questionable morals and an unpredictable mood. Baron Samedi slot game comprises 5 reels and is played across 25 paylines. 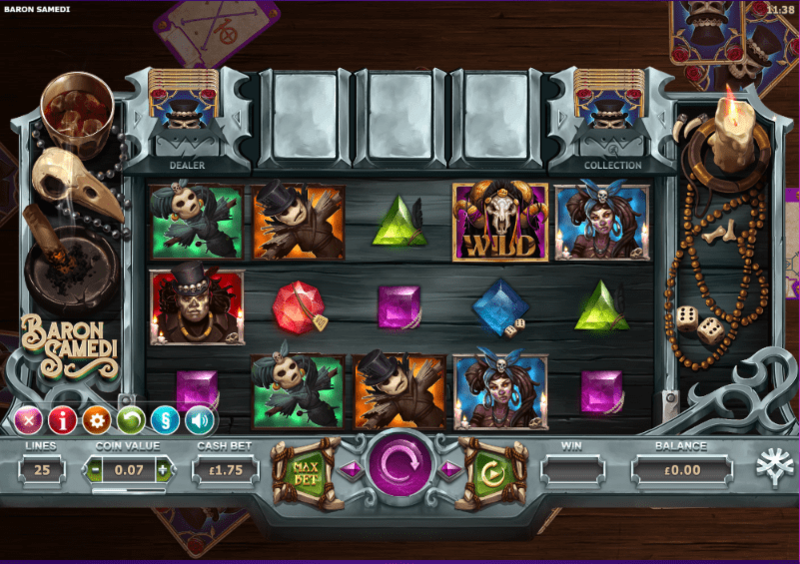 This voodoo themed game has bags full of features to sink your teeth into including super stacked symbols, multipliers, mystery symbols, free spins and random wilds. Players keep coming back for more of this best new video slots because of its spooky theme. There’s more than enough to keep you occupied and to keep Baron Samedi at bay as he will be hot on your heels. Their visuals are in keeping with the Voodoo theme and you will encounter gemstones, candles, the dice of fate, Baron Samedi’s cigar, a bird’s skill and a potion cauldron on the reels, ready for the almighty dark lord to stir up some black magic to summon riches for those in his favour. Keep your eyes peeled for the Wild symbol, which is depicted by an antelope’s skull, as this will replace all other regular paying symbols. Take advantage of the Voodoo Respin feature which can be triggered if you land two or more free spin symbols on the reels. 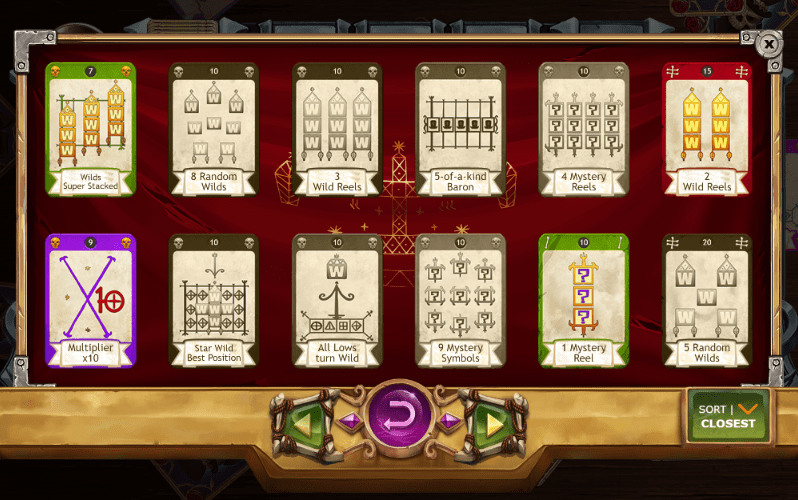 Once this is triggered you will be presented with 3 cards giving you an array of bonuses which can include mystery reels, mystery symbols and super stacked symbols to name just a few. This slot game is renowned for its generous amount of free spins that are on offer, you trigger this when you land 3, 4 or 5 free spin symbols and you could win up to 1,000 x your bet through this exciting feature! The graphics, design and visuals in this game are top of the charts, Yggdrasil Gaming have truly outdone themselves when they created Baron Samedi. The fantastic graphics are brought to life by the accompanying soundtrack which will have you completely mesmerised. This is a truly enchanting game and is full to the brim with ways to win and exciting features to keep you on your toes. Better still, this slot is optimised for mobile and tablet play, so you can dance and play in the underworld whenever and wherever you are. What are you waiting for, mortal? Give the reels spin and join the debaucherous, lewd and charming Baron Samedi in the world of Voodoo and black magic. And if you enjoyed playing Baron Samedi, why not play Jack In A Pot?